The Rep. Peter King Muslim Hearings….. This Dog is of two minds on Rep. Peter Kings (R-NY) Theatre up on Capital Hill…. I have to say that I applaud the Congressman from down road from me for coming out of the closet on the issue…. I stopped going to that store…. The guy lost all of his regular customers and was replaced in the store by another family member that is a US citizen a has his kids in out local schools…. He does not bring the incident up…. If Peter King’s hearings can help the parents who are suffering then that’s good…. If Federal, State and local police can testify that there HAVE been Muslims that come forth to help keep America safe…. Sunlight and knowledge of these issuers are good for ALL Americans to see and understand…. As american’s are christians, jews and muslims…. But as we the American people have always been.. But want to BE us…. 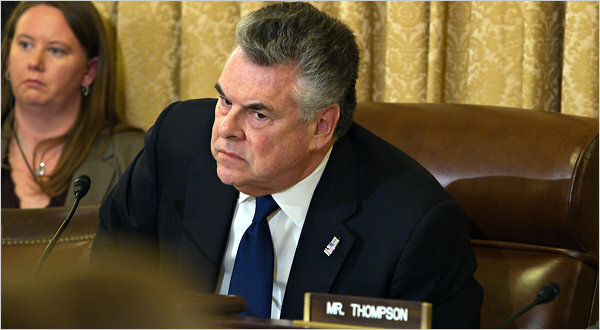 Representative Peter King during a hearing on the radicalization of American Muslims in Washington on Thursday. Representative Peter T. King, who is chairman of the House Homeland Security Committee and represents parts of Long Island, said there was “nothing radical or un-American” in the hearings. “Indeed, Congressional investigation of Muslim American radicalization is the logical response to the repeated and urgent warnings which the Obama administration has been making in recent months,” he said in his opening statement. Mr. King quoted top Obama administration officials as attesting to the threat of homegrown terrorism, listing a half-dozen American citizens and residents accused of plotting or carrying out violence in the name of Islam since 2009. But the committee’s top Democrat, Representative Bennie Thompson of Mississippi, said Muslims as a community should not be accused of radicalism or violence. He suggested that such accusations could play into the hands of Al Qaedaby supporting its claim that the United States is hostile to Islam. “I cannot help but wonder whether this hearing, focused on the Muslim American community, will be used to inspire a new generation of suicide bombers,” Mr. Thompson said. Noting his own roots in Mississippi, he also referred to Mr. King’s Irish heritage; some critics of Mr. King have noted that he was a strong supporter of the Irish Republican Armywhen it carried out terrorist attacks in the 1980s…..
Wisconsin Legislators’s Pass Governor Walkers Law…. The Wisconsin state Assembly has passed Gov. Scott Walker’s bill to roll back the rights of public employee unions, capping off a month of protest and controversy that has gripped the state. The bill now heads to Walker for his signature. The final vote count was 53-42. It followed Wednesday night’s passage in the Senate, and the surprise maneuver that Republicans had undertaken to move ahead on the anti-union provisions on their own. The GOP prepared a new bill that stripped out clearly fiscal elements, allowing them to move ahead without need for a three-fifths quorum required to vote on budget bills — though Democrats have argued that the bill still contains fiscal elements, and they could potentially challenge it on that basis. In Thursday’s Assembly session — which was delayed due to a security lockdown of the Capitol — the Democrats, clad in specially printed orange T-shirts that declared their labor solidarity, delivered many speeches and lodged many motions, in part to register their protest and in part to delay the vote. By contrast, only a few Republicans spoke, speaking of their concerns about maintaining the state’s finances, making hard choices and avoiding layoffs by relieving the financial pressures on local governments. A new series of battles in the state now seems all but assured. Democrats have pledged to recall the Republican members of the state Senate who are eligible, under the state law requiring at least one year of a term to be completed, and then to go after Walker next year.